Common sense or not, real estate agents are biased towards rising home prices. While unions negotiate their pay increases with corporations and governments, a real estate broker's annual raise depends on the housing market. When home prices go up, so do commissions. Instead of negotiating salary with employers, real estate agents try to influence the direction of the property market. No, I don't think there is collusion of any sort. Instead it's a matter of simple interpretation of basic facts. For instance, according to the real estate cartel, rising property prices is a good thing. But are they really? Last time I checked, everyone was complaining when the price of gasoline went up. Lately some real estate agents are pushing the idea that real estate is more of an investment than just a place to live. But is it really? I am not denying the fact that you can make a lot of money in real estate, but is it really a long term investment? Nobel prize winner Dr. Shiller suggests it's not. But just how dependent on appreciation is a real estate agent's commission? Based on a tweet by Tara Perkins I have made a simple calculation. 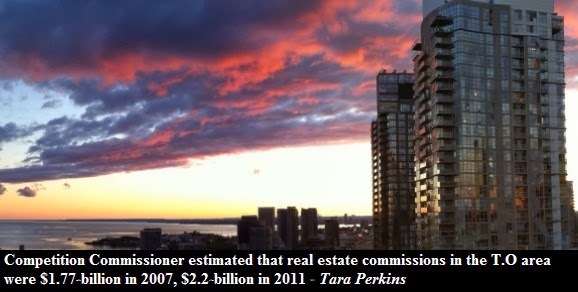 Between 2007 and 2011 the average real estate agent's commission increased from $19,000 to $24,600 - or 30%. 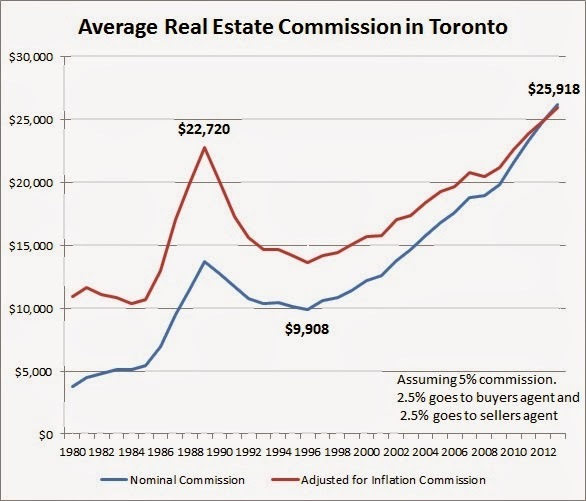 During the same time span home prices in the GTA increased by 24% and the average hourly wage went up by only 10%. Now I am not saying that real estate agents do not deserve the money they make or that they've got it easy. I personally know several brokers who work very long hours in order to get their piece of the pie and their life seems like hell compared to mine. Nevertheless, my point is that there is an inborn predisposition in the real estate world towards rising home prices.